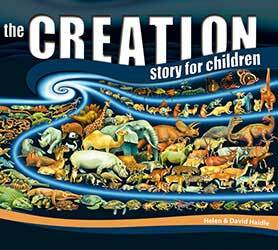 These preschool through early elementary creation science resources are published by Master Books. The Noah’s Ark Preschool Activity Book is a collection of six previously published coloring books for preschoolers. Set this book aside for special times when you are working with your older children and your preschooler want to do school, too! It will keep those little hands busy while offering learning about important preschool topics. Topics in the Noah’s Ark Preschool Activity Book include the following. Colors: From different animals to the wonder of rainbows, children have the opportunity to discover a collection of wonderful colors that make God’s world beautiful! Opposites: Empty and full, big and small, dark and light, short and tall, children will learn important opposites and see Noah’s family preparing for the Flood! Numbers: Learn how Noah’s ark contains numbers 1 to 10 as you begin counting, reading and writing these numbers as you practice them again! Shapes: Hearts and circles, ovals and squares, you can find so many shapes among the ark and the animals while learning important biblical details! Letters: From antelopes to zebras, yaks and koalas, and more, learn capital letters and little ones too, discovering the alphabet animal names for Noah’s floating zoo! Basic Skills: Singing Noah’s alphabet song, deciding right from left, and saying letters and numbers in order are among the skills that you learn! 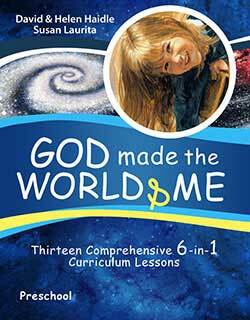 For preschoolers, God Made the World and Me has 13 lessons about creation. There are science, physical, and art activities. Scripture memory verses will be learned in each lesson. It uses scriptures from the KJV except where noted. Grade: Preschool, this can be used to supplement your preschool homeschool program, as a VBS curriculum, or as a Sunday School course for one quarter. A is for Adam is designed to teach Biblical truths to young learners in a fun and educational way. Beginning with creation and ending with the new heaven and earth, your will learn the timeline of history. Spiral-bound easel book allows student to view the illustrates pages while the parent reads the interactive content on the other side. In D is for Dinosaur, Ken and Mally Ham share Biblical insights of Noah’s Ark and dinosaurs for the next generation. N is for Noah presents the account of the building of the ark, the flood, and Noah, a man of faith, in rhyming verse. 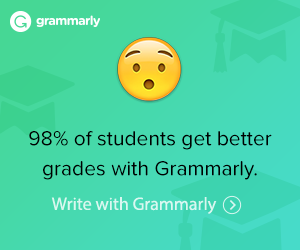 Skills such as memorization and comprehension will be developed with this interactive format. Spiral-bound easel book allows student to view the illustrates pages while the parent reads the content on the other side. Based on Genesis 6-9 in the Bible, The True Story of Noah’s Ark is true to the Biblical record and timeline of events concerning Noah and the Great Flood. The beautiful illustrations in this book are in full color. The True Account of Adam and Eve emphasizes the importance of Adam and Eve as literal history for all ages. It helps children discover the truth about the first man and woman and how their disobedience led to the need for Jesus Christ’s sacrifice. The lovely illustrations in this book are in full color.